There are some food combinations that everybody knows about - Lamb and Mint, Bangers and Mash, Strawberries and Cream - but then there are others which people might not have tried, those that are a little bit 'out there'. Venison and Chocolate, Stilton and Pear, even Peanut butter and 'Jelly' are all great combos that really shouldn't work, but do. Which brings me quite nicely to Oysters and Stout. I think it probably lies somewhere between the two groups I mentioned, it isn't exactly a crazy combination, but it might be one that lots of people haven't tried. But you should. The salty yet sweet creaminess of Oysters clashes and yet somehow matches with a smooth, roasted Stout to create one of my all time favourite food an drink combinations. 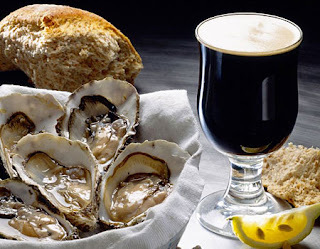 I suppose in some ways the creaminess of Oysters pairs with the creamy body you get with Stout, but if i'm honest, they are completely different. It's a famously tough one to explain, but the most important thing is that it works. It's a combination thats been around for hundreds of years, and reputedly dates back to the dingey London dockland pubs that dished out pints of rough Porter and (later) Stout along with bucket loads of cheaper than chips Oysters. They were a cheap food served with a cheap drink, eaten by the masses by the bucketload. And it's no doubt because of their cheapness that brewers started to wonder what a beer made with them would taste like. That's right. They put Oysters in the beer. Those crazy olden days guys. No one would do that anymore though, would they? The only thing close to Oyster Stout that I've tried is the Marstons beer by the same name, but despite the name, there's not even a minutiae of mollusc in the brew. Nada. So when I heard about Red Willow producing a real Oyster Stout named Fathomless, with actual real Oyster in it, I was excited to say the least. Obviously I had in the back of my mind that it might be a little, well, fishy, but I was willing to take the risk. Luckily, its a fantastic beer, and there's even plans to bottle it. Smooth, only slightly sweet, with a nice full roasted malt character and, maybe I'm just imagining this, but a very slight saltiness in the dry finish. The pump clip doesn't give enough information to put the casual drinker off, but the 'just a hint of the sea' is enough of a nod for me, and actually quite accurate. There is definitely something there, curling a finger at your taste buds, lurking at the back of your mind, saying, are you imagining this? oooh interesting. I have *never* eaten an oyster (well maybe in a stew/ paella but never raw), not because I am squeamish, just because I haven't! Get yourself down The Calls Landing, order a Lion Stout (or a Treacle Stout if you want something sweeter) and six Oysters. Enjoy! I enjoyed a pint of this one at The Angel in Manchester a couple of weeks back - a very lovely stout indeed, as you say with a slight sweetness and just a hint of umami or salt in the background. Well worth trying if you see it around anywhere. And it has now been bottled, too. Fuller's Vintage Ale on Cask! ?